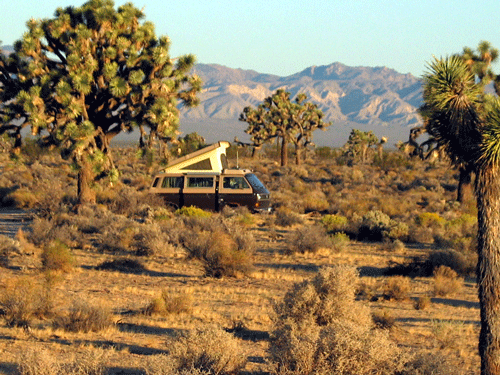 It took ten hours of driving to get to this area just east of the town of Mojave. I set up my camp, cleaned up the mess from previous campers; beer cans and shot gun shells. But they did leave a nice small pile of firewood which I enjoyed when it got dark. I heard an owl and saw a bat. This morning I did a short walk through the sagebrush enjoying the early morning bird song. I heard, but not see, quail. There were other small birds, gray with long curved beaks, (I’ll look then up later), flitting around in the Joshua trees. But I still had it in my mind walking Boron and Trona. When I arrived in Boron I changed my mind. Pretty rough neighborhoods and lots of dogs. When I arrived in Trona I changed my mind again thinking I rather walk amongst the beauty of the desert. This evening I will do just that. Yes, Ballerat, California was named after Ballerat, Australia. Thanks for the comment SisTer!